PRICES AVAILABLE BY REQUEST. All works come framed. 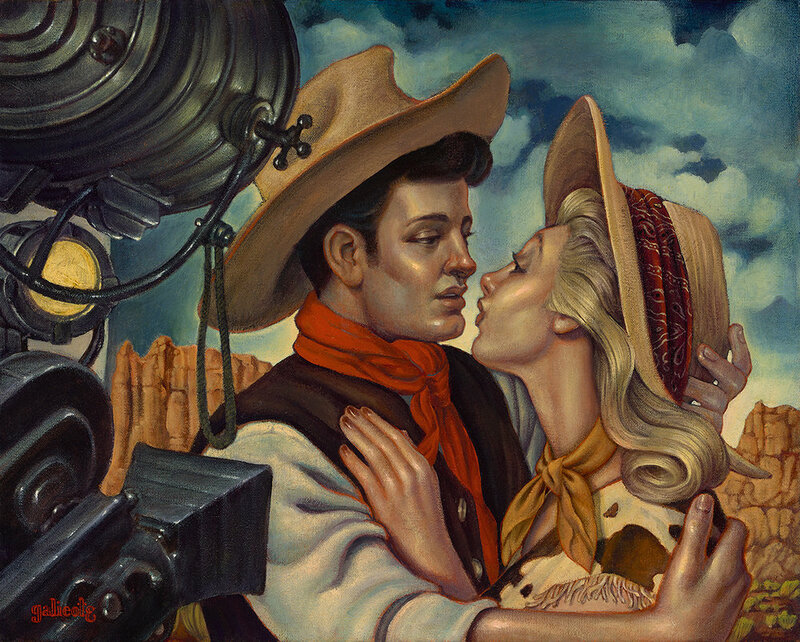 Danny Galieote’s signature Americana style will be on display in his solo show, Made in the USA, at Maxwell Alexander Gallery. Made in the USA features large-scale work reinterpreting timeless rural narratives for a modern audience. Pulling from the drama and accessibility of mural work from the Works Progress Administration (WPA), Galieote similarly designs and edits his pieces for flow and impact. “Murals read well from a distance when they are well designed, and they have a sense of flow and fluidity. That’s really what I’m going for,” Galieote states. 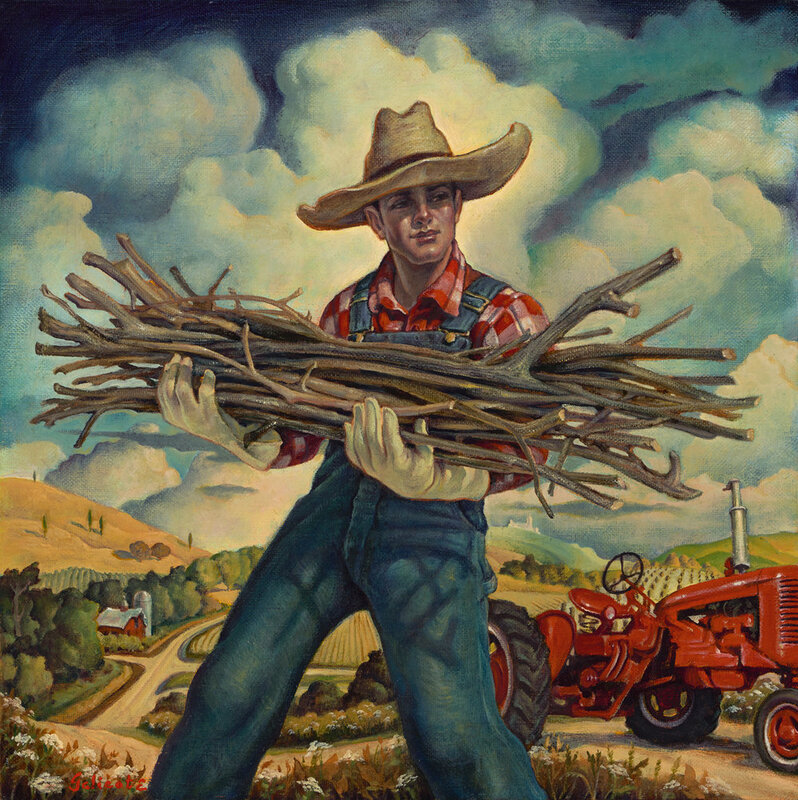 Afternoon Pastoral features a panorama of working rural farm life in a pastoral setting. Men and women survey the land, reveling in their slice of paradise in the American West and the pride of working the land. Bronc Moon however provides more of a dramatic narrative for the viewer. In this piece, a bucking bronc with a charismatic rider top the visual space of a mesa, serving as an icon to the free spirit of the American West. With his statuesque, Pop Art figures, Danny Galieote creates paintings that feel timeless. 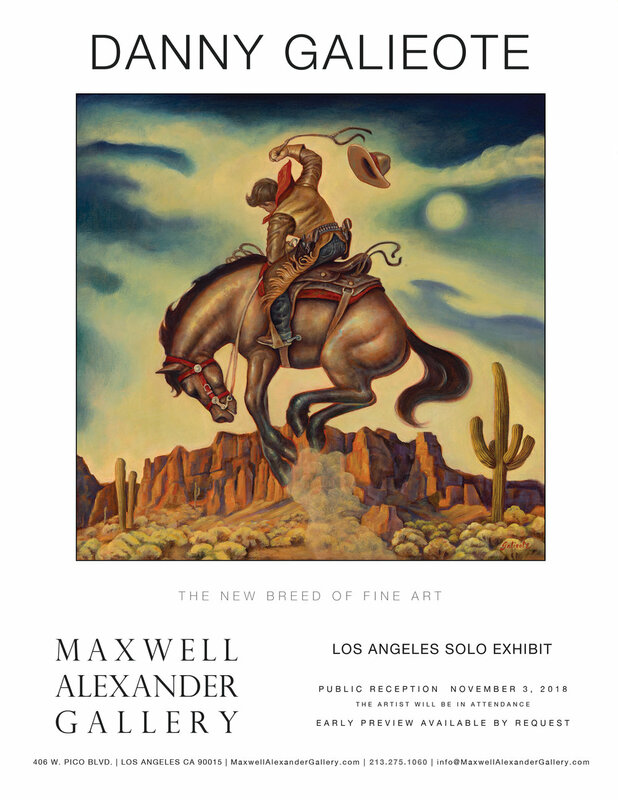 At Maxwell Alexander Gallery in Los Angeles, he will show his works in a solo exhibition that takes place November 3 through 25. The artwork of the time was incredibly touched by the Works Progress Administration, which commissioned artists to complete thousands of murals. “Murals read well from a distance when they are well designed, and they have a sense of flow and fluidity. That’s really what I’m going for,” the artist says.